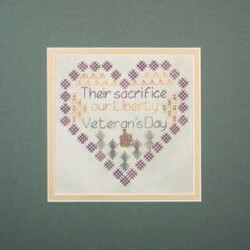 A purple heart honors the veterans in our lives, with this sampler that remembers "their sacrifice, our liberty". Worked with Crescent Colours Camouflage, Sassy Brass and Rainy Day, the stitches (diagonal broad cross, arrowhead, triple tied oblong, sheaf and backstitch) surround an eagle charm in antique gold. The sampler is 5 ½" x 5 ¼", 74 x 71 stitches, shown on 28 ct. Thyme hand-dyed Jobelan (can be worked on 14 ct. as well). 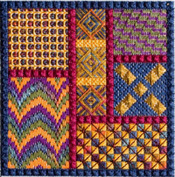 Finished size 5 ½" x 5 ¼"